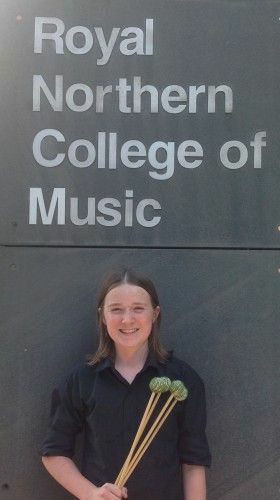 A talented young musician from Kendal has been awarded funding to attend the Junior Royal Northern College of Music in Manchester. 14 year old Sam Nicholls received £750 from the Johnson fund to study orchestral percussion and piano at the prestigious conservatoire. Sam attends every weekend, where he takes part in individual percussion and piano lessons, improvisation and musicianship classes and ensembles. Sam has been playing the drums since the age of seven. At the age of ten, he was introduced to one of the country’s top jazz drummers, Dave Hassell, who has provided private tuition to Sam over the last three years. Dave recognised Sam’s potential as a musician and encouraged him to apply to the college which provides expert tuition to young people with exceptional musical ability. In just one year, Sam managed to reach grade 5 percussion, playing xylophone, marimba, snare drum and timpani. He excelled in his exams, achieving a distinction with an overall score of 136 out of a possible 150. Since attending the JRNCM, Sam has been able to develop his musical talents further. Sam’s mum, Sue Nicholls, said: “The JRNCM has opened up more musical opportunities at a regional and national level. Sam was invited to take part in Haffner, an adult orchestra based in Lancaster, and was asked to play at the Sage in Gateshead. He has also been invited to play percussion for the National Schools Symphony Orchestra and has successfully auditioned for the National Youth Jazz Collective.